i'm almost certain i've written a post before with the exact same title. i won't link to it because i think i was having a bit of a hissy fit when i wrote it (though i do recall not posting it for almost a month to ensure i really meant it...turns out i did!). i'm totally zen today (leaving on vacation in six days - who wouldn't be!? ), but i found this artist interview to be incredibly interesting and wanted to share it. let me first provide a disclaimer by saying that i have total and utter respect for artist and writer noah becker. his work was one of the first i was introduced to in the university of victoria art collection. and in fact one of my favourite pictures of myself was snapped during an exhibition installation in which i am adjusting a piece of his work on the wall. in this interview, he is interviewing legendary mid century artist frank stella. 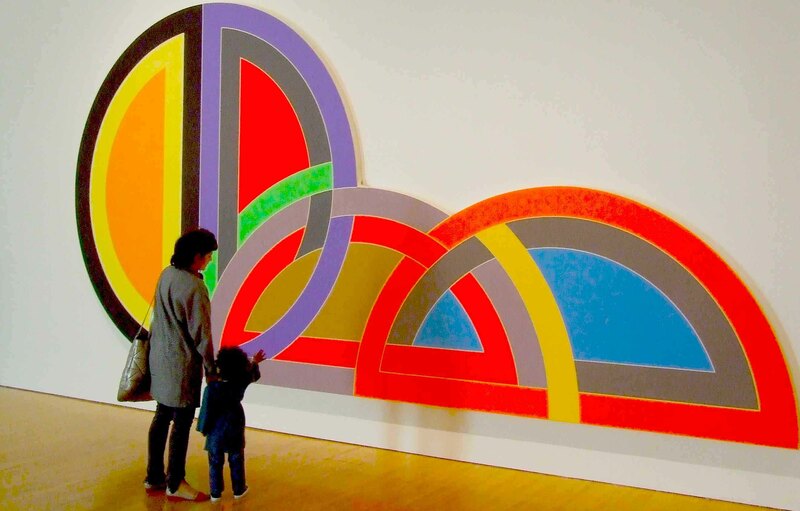 come on - you know frank stella right? well you do, just click here, and here and here. i learned about stella in one of my undergraduate art history courses. i was wooed by the primary colours and the interlocking shapes. the thought of interviewing him is enough to make my stomach drop down to my feet. like becker, i would have researched everything about the artist that had ever been written. and like becker, i would still go in wanting to know more about "the stripe paintings from the 1950's and 60's." but as i read through the interview i couldn't help but think about how down to earth stella seems to be. becker tries in to get stella to express some sort of complex, convoluted meaning behind his work. and every time stella responds with the simplest of answers. NB: "what are they about?" FS: "well, what are you about? [laughs] i mean what is anything about? they're kind of abstract art..."
NB: "you have an interest in repetition in in. a repeated form." FS: "yeah, actually i didn't think of that. i mean, there are three or four different forms of it. i guess you're right." NB: "i was reading somewhere where you were talking about samuel beckett and the repetition in beckett's work as being influential." NB: "yes, and it seems to me that there was a kind of rebellion, earlier on in the stripes that i was talking about...."
FS: "at the time that’s what was said, but it’s not true. or not accurate anyway… that’s like saying that rothko or newman wasn’t an abstract expressionist painter. but they were painters at the time, so their paintings were particularly gestural or all-over-like. but they were still in the genre. you know they were out of their time, and they weren’t particularly against anything except for trying to be themselves." which is an incredible thing to hear from such a giant of modernism. it brings me back to art history class and the "grand legitimating narrative." we learned about this narrative (perhaps becker did too? ), which was essentially a grandiose story about how each art movement developed and played upon or rebelled against the one before it. but in retrospect it was art historians who created this narrative, not artists. and it occurs to me now that we (curators, art critics, art historians) wanted to find meanings and connections in the work and the periods - but perhaps as stella says... it was just artists "trying to be themselves." becker keeps trying to get stella to use "art speak." but the artist is stubbornly himself. and himself seems to be a man creating art because he likes the look of it. which of course leads back to my title, and my belief that "art is lowercase." art does not have to be highbrow, or convoluted. it can just be. p.s. here are some interviews i've done for the blog.